Oh my goodness, it’s finally cooling off a little this week, which means I am determined to get in the bus to get some work done! Yay, hooray! This is the kind of project that wears me out during the day (from all the manual labor) and keeps me up at night (dreaming of possibilities)! I have a general layout decided in my head and even some specifics nailed down. 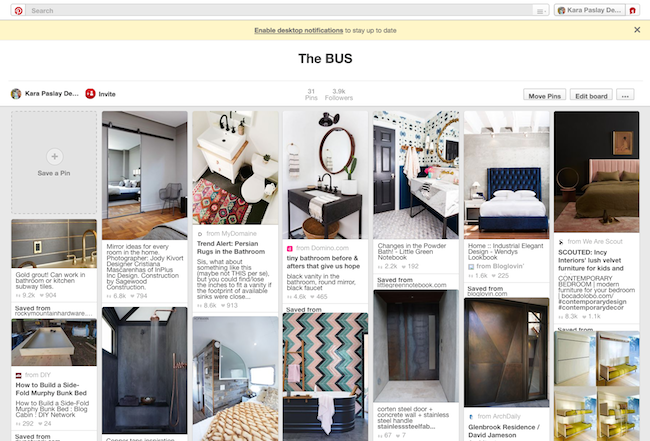 BUT I’m definitely still thinking through all the elements I want to see in my bus as well as all the functional details! 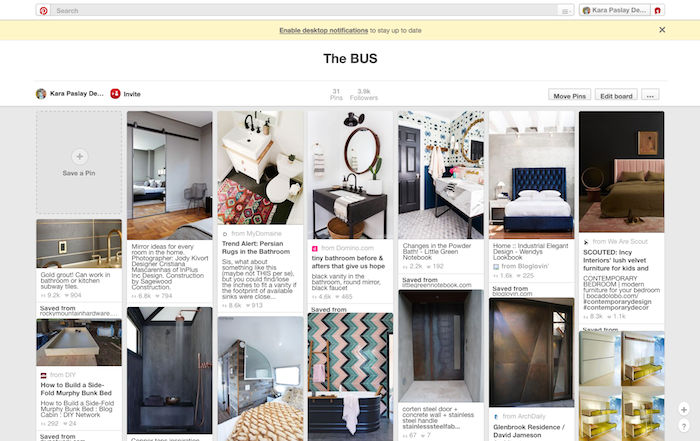 If you’d like to get a peek inside my head and a few ideas/looks that I’m envisioning, check out my pinterest page dedicated to “The BUS“……. Any experienced RV-ers out there? I’d love to hear some of your tips, do’s and don’ts, thoughts, ect!!! Search these hashtags on Instagram #skoolie #busnik #skoolielife #busconversion. Lots of cool pages and ideas out there. I would consider replacing the insulation with the new expanding blown in insulation. This will definitely be something we do if we get the chance to do another conversion. We have four a/c units in our 40ft Eagle and they struggle to keep up during the hot summer months. Also, we have a bunk room in the middle of the bus that has six bucks. I wish we would have only made it four bunks replacing the bottom bunks with pull out storage drawers. My husband’s grandfather once did a conversion with a sunken tub that utilized a portion of the underneath luggage storage area- so there’s an idea! Ha. Look up Prevost buses. Those are the top of the line and should provide some excellent ideas.